The RSP Astrum is a budget priced but well constructed rear LED in the clip-on tradition. Amazon are selling it for £15 delivered (25% off) at the time of writing (it’s not stocked by the usual mail-order companies). The RSP Astrum has a clip on the rear which allows you to attach it to items of clothing, bags, and so on. It is also supplied with a sturdy seatpost mount that secures the light using the same clip. Unlike many rear light mounts, the Astrum has a big thumb-friendly screw-drive affair which makes it a dream to fit and adjust. Giant thumbs up from me! Fortunately the Astrum’s seatpost mount is sturdy and easy to fit. I recommend this approach over the alternative, even if you want the Astrum as a backup light. The Astrum has two flashing modes (one on, one off and both flash together) and offers a solid mode too. One LED has a plain lens while the other is fitted with a diffuser. This casts light out at a much wider angle – improving the light cast to the sides at point blank range. The Astrum is extremely bright – so bright that it’s unpleasant to ride or drive behind someone using it, especially in flash mode. While this may be great in some circumstances, making it unpleasant for people to drive behind you can definitely encourage them to overtake. 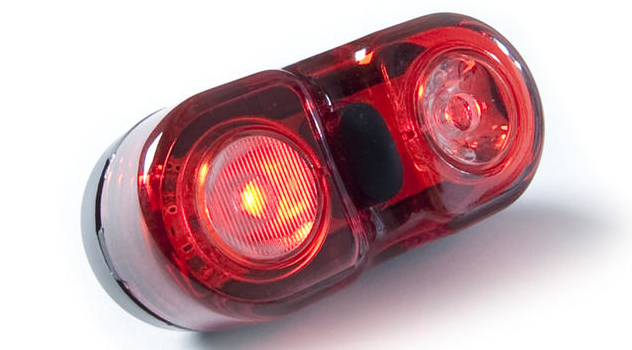 As a driver, I can vouch that sitting at night behind someone with a mega LED flasher definitely makes a quick pass more tempting. Because the RSP Astrum hasn’t passed the relevant tests it isn’t road legal when used on its own (in any mode). The Astrum has a central and large rubber button which is a breeze to use, even with gloves. This is a much better solution than the end-on ‘soft body’ style buttons you can find on other lights (like the Smart Lunar R2). So far my Astrum is still going strong after two and a half years. A big part of this is the quality of construction of the ‘interface’. The Astrum runs on two AAA batteries. We get around the stated battery life (80 hours flashing, 20 hours solid). Remember that the temperature at which you use the light and the type of battery used both influence that figure. The RSP Astrum produces quite a lot of light and so is fairly battery-hungry. A genuine 0.5W LED current draw would give a battery life of just six hours on AAA, so 2×0.5W would give just three! The Astrum is well sealed, as it would have to be to survive three winters unscathed. The quality button construction (see above) plays a large part in this. Assuming you run mudguards, you can improve the reliability of any rear light by mounting it under the saddle (fairly sheltered) instead of on your body or bag. The RSP Astrum 2×0.5W rear LED light is a great little number – well built, easy to operate, extremely bright and with a mount that’s head and shoulders above some competitors. Again, Amazon are selling it for £15 delivered (25% off) at the time of writing (it doesn’t seem to be stocked by the usual mail-order companies). With regard to durability I attempted to change the batteries in my Astrum light at the weekend and when I tried to remove the back cover to access the battery compartment the red lens came off and the battery cover remained in place. This is not normal! There seemed to be very little evidence of a good adhesive joint between the lens and the body of the light. There were only a few black spots on the contact surface of the lens, evidence there had been a joint. The parts were well cleaned with IPA and bonded back together with a liberal coating of epoxy adhesive as it is a good light and was still fully functional.